Can you see the cracks in the screen? It’s extra creepy when I’m looking at this picture of screen cracks through the real cracked screen. Allow me to give a little public service announcement. Last weekend I dropped a filled duffel bag while attempting to load it into our car-top carrier for our holiday trip to Tampa. It fell from the top of our SUV, and in the bag were my Macbook and iPad. 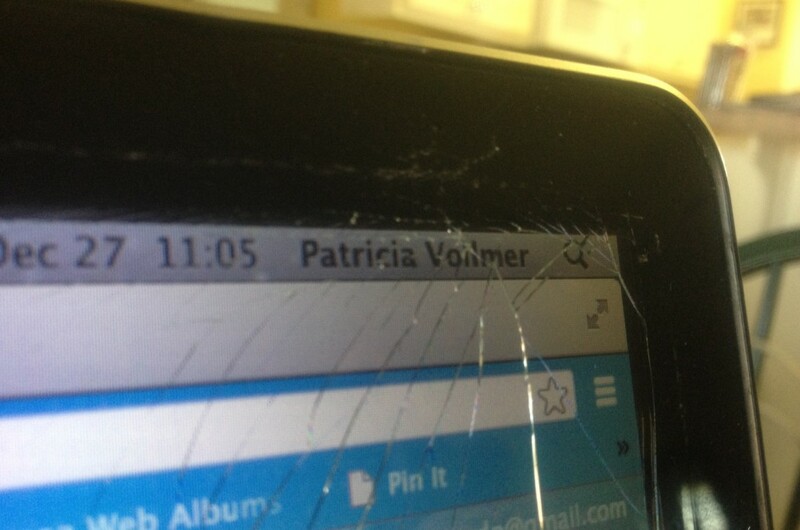 The iPad was well-protected, but the Macbook was not; the screen shattered and one corner of the aluminum body crushed. Don’t yell at me, I’ve been fussed at enough about this. The computer is still working decently, although I can occasionally feel the cracking of some small shards of glass inside the keyboard. We have USAA Property Insurance (being a military family and all), and we immediately called them about our options for getting the computer repaired or replaced. Glitch: Where Webkinz Meets Dr. Seuss in The Shire! The GeekMoms drew me into this new world of video gaming: the MMORPG. I know, many of my readers (hi Mom and Dad!) may not have heard that term, so allow me to educate you. MMORPG = Massively Multiplayer Online Role-Playing Game. A couple fellow GeekMoms got to be alpha- and beta-testers for this new game called Glitch. It went public on September 27th, and is amazingly addictive! If you know a player, you can get in pretty quickly, but if not, it’s about a 48-hour wait for the official invitation once you give them your e-mail address. Once you’re in, you choose your avatar, undergo a little keyboard/mouse-ology on how to navigate the Glitch-world, and then you’re set out into the wild. Like Webkinz, you’re responsible for the care and feeding of your avatar (grow/buy food, earn money, make a living, get educated, get a house, etc. ), and the visuals are similar to an elaborate Dr. Seuss novel! Here’s my Glitch window from this morning. Impressive that this is all web-based, so I can play from anywhere (dangerous!). I’m standing in the center of the space, with my dusty-rose colored hair and all. My name is “Scruffette” (Jacob’s idea), and you can see here that I’m chatting with fellow GeekMom “ChaosMandy” in a window on the right. she was giving me some help with how to earn enough money to buy a house. Check out GeekMom Lissa’s review of the game, she was a beta-tester and is now on level 10,000 or something like that now…. 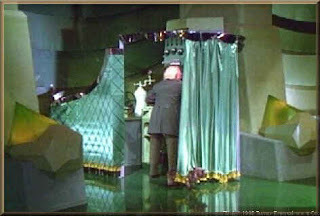 Pay No Attention, Nothing to See Here…. This is just a filler post to run a fun little experiment. I am going to compare RSS Graffiti with Networked Blogs and see which syndication posts to my Facebook page faster. I’m leaning towards keeping RSS Graffiti because it didn’t require the widget on my site, nor did it require me to pick 5 blogs to follow like Networked Blogs does (note — I proceeded with the registration after only selecting two blogs to follow: Fotomom and Sergeant Major Mom). If I keep Networked Blogs I will add more to follow. My First-Ever Blog Post, Revisited! …which wasn’t on this blog. It was on MySpace in July 2006.
that’s just the link to one blog. To see everything I wrote between July 2006 and August 2007 — I stood up this Blogger.com blog in December 2007 — use this link and select the “More” button at the bottom of the page until you get to July 2007 posts. I’m guessing most of you won’t care, and that’s okay. I barely care myself. I hadn’t been to MySpace in quite some time and it’s way different now. In fact, it’s not even really “MySpace”, but “My_”. Really??? I connected my Facebook and Twitter accounts to it — so it isn’t sitting absolutely dormant, but really I don’t pay that site much mind anymore. The webcam on my HBTS Rexford St. Weather Underground setup is dead. I don’t think it’s the webcam itself, it’s most likely the laptop that was hosting the webcam. That dastardly “kitchen laptop” that I’ve kept alive all. these. years. Anyhoo, since the screen on the laptop isn’t working, I have to plug it into our TV with a VGA cable to see what it’s up to. For all I know, it’s probably some update to the software that I need to download or something like that. I’ll check it out later this week — I’ve a bunch of odds and ends to tend to. New license plate for the Prius (switching from Nebraska back to Florida), squaring away our Family Care Plan, and finally squaring away our claims from our move. In the meantime, I’ve removed the blankness on the tag to the right so conserve a little space. Not a complete fail, but a “mostly” fail. Today I officially gave up on the CrashPlan 30 Day free trial to send files to “the cloud”: the CrashPlan Central offsite servers. I had a 30 day free trial to try this out, and after 27 days, I had only uploaded 60% of the files. I didn’t get enough time to test restoring the files after a full upload, therefore I cut my losses and will do backup another way. Besides, with the recent news about Mozy, I wonder how much longer “all you can eat” offsite data storage will remain affordable. 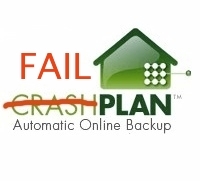 By the way, until the end of February, CrashPlan is offering a 15% discount to Mozy customers who are bailing because of Mozy’s recent price schedule changes. Paul and I attempted some file transfers to each other, but that wasn’t very stable either. Our network settings had to be very precise to maintain a connection. Paul’s fiber broadband pushed about 2/3 of his files to me, but my slower connection only allowed us to give him about 1/3 of the files. I have dynamic IP addressing — so a system reboot would change up our settings and kill the connection. We pushed our respective computers into our firewall’s DMZs, which made me incredibly nervous, and if that’s how we had to keep things permanently, that was also a no-go. I will caveat things to say that it wasn’t a complete wash. Without paying, you can still use the CrashPlan GUI to manage in-house backups free of charge, as well as backups to friends. I’m probably going to stick with that. It’s the only GUI that allows “cross-flow” between PCs and Macs. It also allows you to attach external HDs and network-attached-storage into the setup. Other programs, such as Mozy and Carbonite, have restrictions on that. While I’d read dozens of testimonies to how great CrashPlan worked for their individual needs, I feel that our family’s network setup simply wasn’t going to support things. We have an AT&T DSL connection coming into the house that typically allows for about 7 Mbps download, 1 Mbps upload speeds. When CrashPlan was running, those speeds dwindled down to about 20-40%. Especially when CrashPlan was running on our PC and was uploading data to CrashPlan Central. We couldn’t watch videos anywhere else on our network (i.e. via Netflix streaming, Wii or on YouTube on our computers), so I removed Crashplan from the PC and suddenly things sped up. This morning I re-installed CrashPlan on the PC but cut it off from external network connections. I am hopeful that will be okay. I will keep it to back up our 3 computers’ files to each other, and we at least have that. Better than nothing, right? In the meantime, I’m pricing 2 TB external HDs and will be replacing our two smaller external HDs for day-to-day backups. Paul and I have gone nearly a week uploading to each others’ computers with CrashPlan. It’s been quite successful, in that we are successfully connecting to each others’ computers consistently. That’s the good news. The bad news is that I’m seeing just how slow my AT&T DSL network is. I purposefully selected a data plan that matches what we’d need it for the most — which did not include extreme gaming or running a small business. Something middle-of-the-road. With his FiOS network on the East Coast, Paul has already uploaded all his data (nearly 100 GB) to “the cloud”, while I’m less than 10% through. No fiber availability in my area, unfortunately. Paul’s upload rate to my own machine is more than twice as fast as my upload to him. At my house, we’re also challenged with trying to do other things on our network while CrashPlan is active, like uploading pictures and videos. I have to shut down the data transfer if we’re doing particularly important work. Ever the optimist, I really want to see this through – I wholeheartedly believe that once the initial transfers occur, you can leave Crashplan on and it does periodic updates only…requiring much less bandwidth. Isn’t Schoolhouse Rock the BEST???? I Googled images for “Hooray” and this scene from the episode on “Interjections” appeared. Yesterday we had success! Paul and I did a couple more tweaks with our respective firewalls, and after dinnertime, the grey lights turned green on our CrashPlan GUIs! This point-to-point uploading is going much much faster than uploading to CrashPlan Central (i.e., “The Cloud”). Paul’s machine to mine = 4.1 GB in about 12 hours, my machine to his = 1.7 GB in about 12 hours. All of this is faster than my uploading to CrashPlan Central. If this is successful, then perhaps I’ll pick up a 2 TB external HD at Best Buy and use this as my official backup plan. What we’re doing right now is experimental, lots of band-aids in place to make this work, but I need a long term plan still. I called it. On Saturday I enrolled in CrashPlan for the 30-day free trial and so far I’m not that impressed. Their website claims “Free, Easy, Automatic Backup”. So far, no. Paul kindly offered to sign up also — we can always backup to each others’ machines with the CrashPlan GUI without charge — and we’ve spent the past 48 hours attempting to connect to each others’ computers without success. Too many firewalls, port settings and over-my-head troubleshooting going on here. Paul and I exchanged no less than 30 e-mails last night bouncing different ideas to make this work. Most of the ideas were his…since he’s the one who does IT stuff for a living and understands it more than I do. I guess using iChat or IM might have been easier to discuss this, but for some reason we didn’t. Until we get the point-to-point backup working, I have a batch of files uploading to “CrashPlan Central” which is their offsite server system. This is what I’d have to pay a monthly fee for if I choose to go beyond the 30-day trial. Unfortunately, the backup to “the cloud” has been taking FOREVER. I have a 77 GB package I’m trying to upload (pictures, music, videos) and after 4 1/2 days, 7.9 GB has been uploaded. Go ahead, do the math. About 10.5% uploaded in 4.5 days = 47.25 days to upload this batch of data. And this is only from the MacBook! This doesn’t include the PC’s data (another 125 GB). One of the things I did to try to speed things up was direct-connect the Mac to the DSL modem, taking the computer off the WiFi altogether. I also closed everything this Mac was using that involved the Internet. 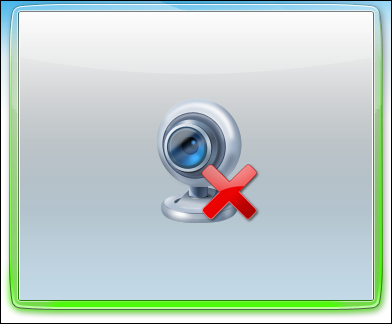 Things like the webcam, weather station and my iPhone on the Wireless were still taking down the bandwidth periodically. CrashPlan offers to send you an external hard drive to directly upload to, which caught my attention at first, but for $125 for that service, I figured the time would be cheaper. I understand that once this initial upload completes, the worst of it will be over and we’ll have our data in place. I’ll see how this does through the weekend. If I see better progress, this might be worth keeping…but so far, I’m not quite impressed. Our Weather Station is BACK! We re-assembled our weather station in our backyard over the weekend. We have plenty of fenceline to choose from, and you can’t see the equipment from the street (always a bonus in a deed-restricted neighborhood). You can see current conditions on the right-hand column of the blog now, or you can click on the “sticker” and save that page to your favorites. We also have several other local weather stations with which we can compare our data. I’m not quite sure our wind vane/anemometer set is high enough off the ground, we have some wind direction inconsistencies that we’ll monitor for the next several days. It’s nice to have this back, especially for rainfall information…we can use that data to assess whether I have to water plants.